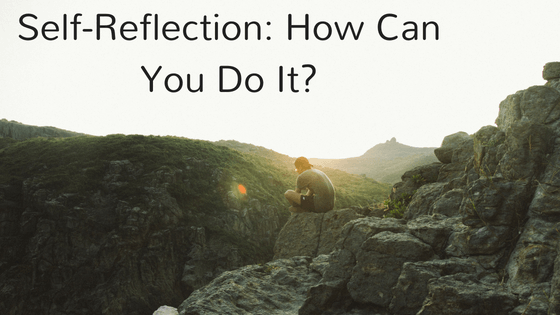 Self-Reflection: How Can You Do It? Self-actualization is a lifelong goal for many people, and there are many ways you can work toward this goal. Reflecting on your life is a great step to take in your realization journey, but many people cannot find the time or separate themselves from distractions in order to reflect. If you find it difficult to take time to learn about yourself, try following this step-by-step guide. Masters of self-reflection might be able to squeeze in a few thoughtful minutes here and there, but getting used to the practice is more time-consuming for some. Try scheduling out some time in your week to begin testing the waters. My favorite times to reflect are first thing in the morning and right before bedtime. When first starting out, I suggest keeping it simple by choosing a comfortable and consistent time, as well as trying to stick with it at least 3 days. If you can’t spare much time, even 15 minutes toward your goal will be beneficial. Once your first self-reflection session comes around, you should prepare by getting comfortable. Find a cozy chair or couch to sit on, make sure you are comfortably warm or cool, and bring a glass of water along. Once you’re comfortable, it’s time for the final pre-reflection prep step. This part is difficult for some people, but it is crucial to reflection. Turn off your phone (don’t just put it on silent), make sure all TVs and computers are turned off, and get rid of any music that is playing. Sitting in complete silence, without screens, is the only way to truly face who you are. For first-time practicers, you might want to bring a small notebook with questions to ask yourself. These can include questions about your actions, your reactions/emotions, or even how you handled a particular situation. Make sure you dig into the reasoning behind your actions and thoughts. Understanding where they come from is a big step toward helping shape your ideal worldview. Once you inevitably identify a weak point in your life, challenge yourself to overcome any negative emotions or actions by brainstorming some positive coping mechanisms. For example, if you always come home cranky from work, consider how you can change your mindset to leave work at work. Conversely, this could be a sign that you need to search for new employment. No matter what your result is, the goal should be to move toward a more positive, productive, and happy life. Taking time to reflect on your day, week, or overall life is one of the best things you can do for yourself. Follow these steps to maximize your success and move forward in your journey of self-actualization.